Emily Binetti and Tammy Parrett contributed to this article. What do the Foxtrot, Asian harmonies and a boxing teapot have in common? They all come together to tell the story of Maurice Ravel’s opera “The Child and the Enchantment,” which will be presented in a unique collaboration between SHSU’s opera program and dance department on Friday and Saturday (Jan. 30-31). Show times are at 7:30 p.m. in the James and Nancy Gaertner Performing Arts Center Dance Theater. 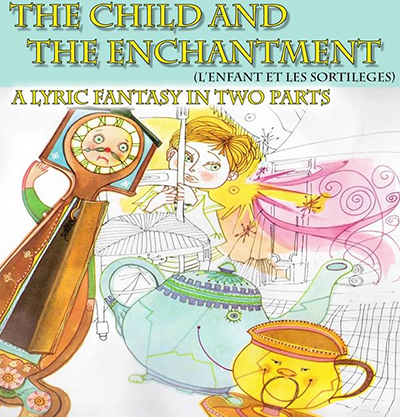 The modern fairytale, with a libretto by the French author Sidonie-Gabrielle Colette, tells the story of a little boy who throws a tantrum and tears up his room. "His bad behavior releases a magic spell that causes everything in his room to come to life and taunt him for being so naughty," said director Rebecca Grimes. "In the end, the child learns the value of love and kindness." "It’s a whirlwind of a story told in 45 minutes," she said. "In addition to the boy and his mother, there are 50 different characters that make an appearance in the course of the show." Students must audition to become a part of the SHSU Opera, the premiere solo vocal performance ensemble in the School of Music. The group recently received the 2014 American Prize for Collegiate Opera Production as well as a second place title in the 2014-2015 National Opera Association Collegiate Music Theater Scenes Competition. Ravel first conceived of the fairytale as a ballet, but it was later commissioned to compose the story as an opera for Monte Carlo Opera, to be staged by Sergey Diaghilev. In the production, dancers provide most of the action of the story, while the singers are integrated into the dance. Running through the entire piece is the naughty boy, sung by senior vocal performance major Sarah Garcia. Eighteen dancers and 24 singers, some of whom play multiple roles, come together for this performance. Helping this collaboration is costume designer Barry Doss, a dance faculty member who has made a career designing on Broadway, as well as for dance companies across the country. The production will also include a special event for the younger opera fans on Saturday, at 6 p.m. in the GPAC Recital Hall. Cast members will offer a pre-concert presentation that will include a reading of the Colette story, a chance to listen to musical selections from the opera, and a special craft project that corresponds to the opera story. Helping out the opera personnel will be Joan Culp, a retired teacher and librarian and supporter of the arts. This pre-concert presentation is free and open to children of all ages. Tickets for “The Child and The Enchantment” are $15 for general admission, $12 for senior citizens, and $5 for SHSU students. For ticket information, contact the GPAC Box Office at 936 294 2339.